With that call on this cold March morning, the roughly two-dozen rowing machines, or ergs (short for ergometers), whoosh into life. The men pull and push in synchronized fashion at first, but soon their motions become more staggered, their faces red and contorted in pain. A young woman weaves in and out of them, making notes, marking times and watching closely. The coach looks on stoically, quietly offering suggestions. The noise of the machines, coupled with the drone of a giant industrial fan, renders the basement of Patten Gym a howling wind tunnel. It is just another Saturday morning for the Northwestern University Crew team. While the rest of the campus was quiet, presumably sleeping off the excesses of Friday night, the rowers, first the women’s team and then the men’s this morning, gamely mounted their noisy steeds and proceeded to wince and sweat and pant through a punishing two-hour practice. It sounds pretty thankless to an outsider. First there are the criminally early mornings, most beginning before the rising sun’s rays begin their dance on the surface of Lake Michigan. Then there’s the wretched pain, shooting through thighs and backs and shoulders, the oars ripping hands apart, and the cold numbing faces on the early spring mornings when they begin to train outdoors. Weekends are often spent far away from campus, sleeping in church basements. Winter practices are relegated to a stuffy room of stationary ergs, and they endure a year-long training schedule that often translates to mere minutes of competition time. All this, and the rowers have to pay to play. 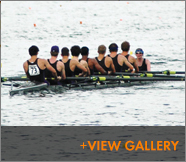 Northwestern Crew is a club sport, and an expensive one at that—varsity dues are a whopping $1,500. No handouts from the University for them. Enduring this level of pain and sacrifice is what gives rowers a reputation for having a screw loose. But for those involved in the sport, the more apt assessment is that said screw has been tightened considerably. The physical torment, the time commitment, and the mental hurdles are not for everyone. This is where concentration and determination come in—and a preternaturally high pain threshold. But for an 18-year-old kid, walking onto a college campus for the first time, rowing offers something not easily found: a sense of place and purpose. Many of the rowers had been athletes in high school and turned to crew as a way to stay in shape and to continue to scratch their competitive itch, said men’s varsity coach Aaron Zdawczyk. In addition, the schedule of early mornings and weekends poses little interference with academics. Technical skills comprise timing, focus, and the fundamentals of propelling a boat swiftly, efficiently and in unison with teammates. It does not, however, mean experience, Zdawczyk continued. Much of the team walked into their first day of practice completely green, having never rowed a day in their lives. But this is not achieved without grueling training. All beginners endure a novice year, where they spend the spring and fall seasons (and in between) learning the technicals, getting in shape, and competing against other novices. When that is through, they can row on the varsity level with three years of eligibility, competing against other club teams near and far. He said this creates a tightknit community where lifelong friendships are forged—partly due to the small numbers but even more because of the nature of the sport. There are no “ball hogs” in crew, no Jordans, no superstars. These are the tough lessons learned early, but ideally, not often. Junior coxswain for the men’s team, Beth Gottesman, Weinberg ’09, called it “the ultimate team sport,” something that appealed to her when she joined the team as the motivational voice and skipper of the vessel. This is a sentiment that comes up often with rowers. Sure, they can achieve enviable levels of physical fitness, but something more intangible keeps their interest alive. In the boat, the rowers experience a sort of communion with the elements. Placid waters, peaceful mornings, and the sensation of perfect harmony with teammates create what Northwestern alumni row chair Mark Klitgaard calls “swing.” It is a rhythm, flow, and energy force that is hard to describe and harder to forget. The feeling, or at the very least the pursuit of it, is addicting, he said. Klitgaard had not been in a boat in quite a while since graduating from Weinberg in 1989 and turned back to it as a means to get in shape. What he discovered, however, was that he had missed the mental element most. Senior Matt Miller said he has experienced this elusive transcendence on the water only a handful of times. Yet the potential to achieve it again is so tantalizing, it keeps him coming back through the winters, through the pain, through it all. The Northwestern Crew team tends to attract a cerebral contingent—biological sciences majors, medical school-bound doctors-to-be, and fledgling philosophers. Most rowers have big plans, Zdawczyk said, and he tries to apply what the students are learning in the classroom to the science, art, and spirituality of what they do on the water. A subject like physics is more easily grasped when buzz words like ‘vectors,’ ‘inertia,’ and ‘drag’ play out in front of the students on the water. As do the coaches. Zdawczyk and his colleagues go out of their way to ensure that academic performance does not suffer. Schedules are rearranged, missed exams are proctored, and practices adjusted to help students excel both in the classroom and in the boat. From a boathouse just west of campus in Skokie, they practice and compete in the spring and fall in the North Shore Channel of the Chicago River. Most weekends, however, are spent on the road, traveling as far as Boston for a single competition, or regatta. In the fall season, four-person and eight-person boats race against the clock, in three to six kilometer head races whereas the spring season pits them against other teams in 2000 meter sprint races. Zdawczyk likens the difference between the two to that of a cross-country runner and a sprinter. One is focused on endurance, the other speed. It’s the competition in the sprint races that gets the rowers the most jazzed. Mark Klitgaard has noticed a discernible lack of trash talking during regattas. He attributes it to the shared experience of tortuous training or perhaps that virtuous pursuit of rowing zen. Nevertheless, it does not mean these rowers don’t long to win. “It’s one of the more challenging things about the sport,” he added. The Northwestern Men’s Crew team, in its 25th year, has seen its competitive ups and downs. Zdawczyk, a Toledo, Ohio native, has watched the results improve in the four years he’s been head coach. Because the regattas comprise so many individual races, rank and records are hard to translate, but the team has racked up its share of gold and silver medals at recent regattas. Success has come despite the fact that their “peer crews” at schools like Michigan, Michigan State, and Purdue have full time coaches and access to varsity facilities and trainers. Zdawczyk’s job is a demanding one, compounded by both his work as assistant director of admissions and financial aid for the University and also because he is a new dad. He loves both Northwestern jobs but is finding it increasingly difficult to maintain the zeal and time commitment that they demand. He has a tremendous influence on student life as part of the admissions and financial aid process but has developed emotional ties with his rowers, having now seen this current crop of seniors develop since they were walk-on freshmen. He is proud of how well they have represented Northwestern. Zdawczyk is not making any decisions quite yet about his future. In the meantime, he will continue to coach, taking his team to South Carolina for spring training and back on the boats to shake off the doldrums of winter indoor practices. He will continue to help his rowers raise funds. He will continue to mold his team into a unified, disciplined, living organism moving as one on the water.